Another Dimension, edited by Angel Leigh McCoy, was the recipient of a 2017 Serling Award. 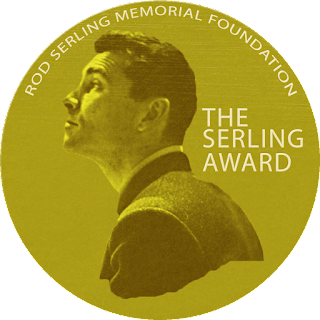 The Serling Award is bestowed annually by the Rod Serling Memorial Foundation. It is "given for achievement in the artistic aesthetic Mr. Serling endowed upon the world." I am thrilled to have been a part of this anthology. I contributed two pieces: a short story, "The Next Thing," and an essay in celebration of Twlight Zone writer George Clayton Johnson called "Selling Daydreams: The Life and Work of George Clayton Johnson." Thanks to Angel Leigh McCoy for including me, the other contributors for thier excellent stories and essays, and the Serling Foundation. You can read about the award and the Rod Serling Memorial Foundation here. And pick yourself up a copy of Another Dimension here. See a Penny . . .